This kale chicken salad with apples and potatoes is the quintessential fall harvest recipe. It’s made with super crispy freshly picked apples, farm fresh kale, grilled apple cider chicken, and warm potatoes, then dressed with a sweet and tart maple cider vinaigrette. It’s cooked entirely on the grill, making for an fast and nutritious weeknight autumn dinner. Weekend before last we went apple picking at Catoctin Mountain Orchards and came home with 30+ pounds of jonagolds, galas and crimson crisps. The galas will fuel Cass’s apple-a-day habit for quite some time, and the jonagolds will make an appearance in a baked good or ten over the next few weeks (they’re a superior baking apple). But those crimson crisps? Those babies are special. As the name might indicate, they’re super crisp with a rich flavor that perfectly balances sweet and tart. Excellent salad apples. I picked up a gigantic bag of kale at the farm store for like $2. Ridiculous. And I had been working on this recipe for apple cider chicken for a few days. So naturally a kale chicken salad with crispy apples was necessary ASAP. Pin it now! Click here to pin this recipe for Kale Chicken Salad to your recipes board on Pinterest. 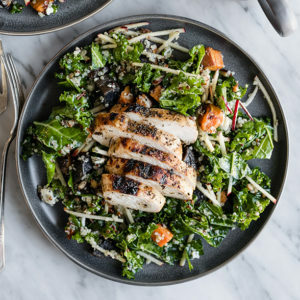 This recipe for kale chicken salad comes together quickly and all of the cooking is done entirely on the grill, which means I don’t have to clean any pans. That’s my kind of weeknight cooking. While the grill is heating up for the chicken, chop up a few potatoes (about 1/2 lb) and toss them with some olive or avocado oil and a healthy pinch of salt and pepper. I used half purple potatoes and half sweet potatoes because they’re pretty and it’s what I had in my pantry. Use whatever strikes your fancy, but keep the skins on and dice the pieces on the smaller side so they grill up quickly (about 1″). Spread the potatoes over a grilling tray. I love this type of grilling tray – the grates are small (vegetables won’t fall through) and the handles making placing and picking up (with mitts) super duper easy. While the chicken and potatoes are resting, it’s just a matter of chopping up the kale and pecans, crumbling the blue cheese, and preparing the apples. I always julienne apples for salad because the texture is amazing and again, pretty. I have a Swissmar Julienne Peeler that I’m obsessed with and I know I talk about it all the freaking time but it’s the most versatile little kitchen tool and you should totally have one. Anyway, where were we? Ah yes, dressing. Maple vinaigrette kids. This is where the magic happens, and it elevates this kale chicken salad from pretty freaking great to awesome AF. I modified my go-to recipe very slightly and added a splash of straight up apple cider and it was perfect. I tossed in a cup of cooked quinoa simply because I had it in the fridge already. Keep or omit, it’s totally up to you. 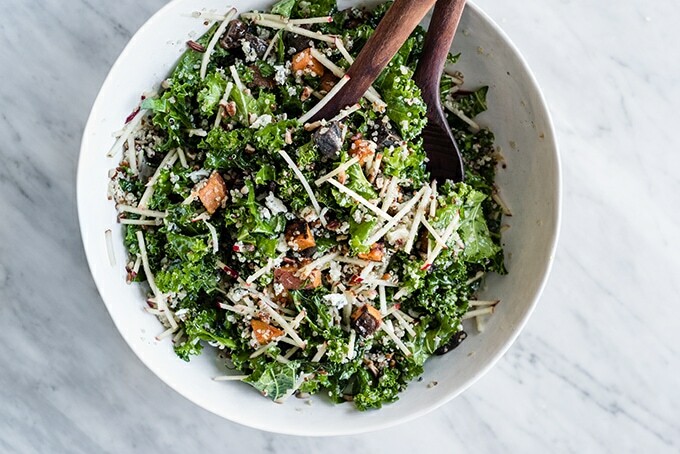 My recipe for apple cider chicken is the only way to top this autumn kale salad. It’s the best freaking chicken you’ll ever eat. Pinky promise. PIN IT NOW, MAKE IT LATER! 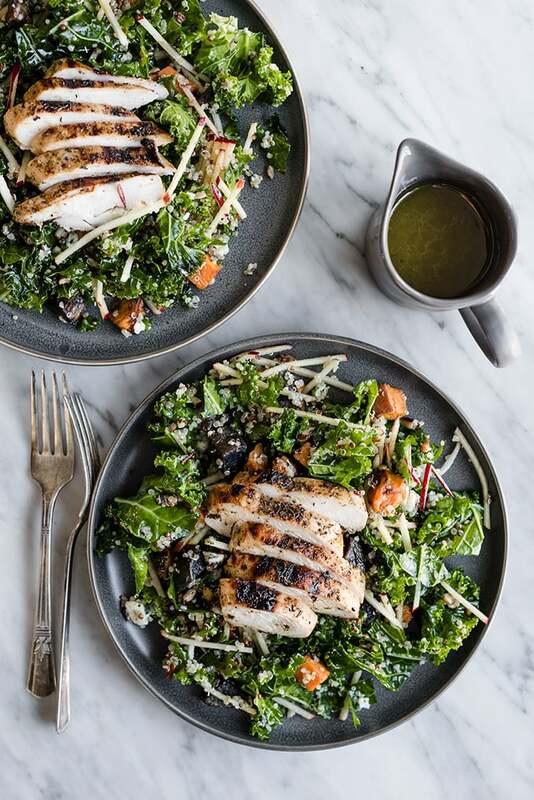 CLICK HERE TO PIN THIS RECIPE FOR KALE CHICKEN SALAD WITH MAPLE CIDER VINAIGRETTE. WHILE YOU’RE AT IT, LET’S BE FRIENDS! FOLLOW ME ON PINTEREST FOR MORE EASY, SEASONAL RECIPE IDEAS. 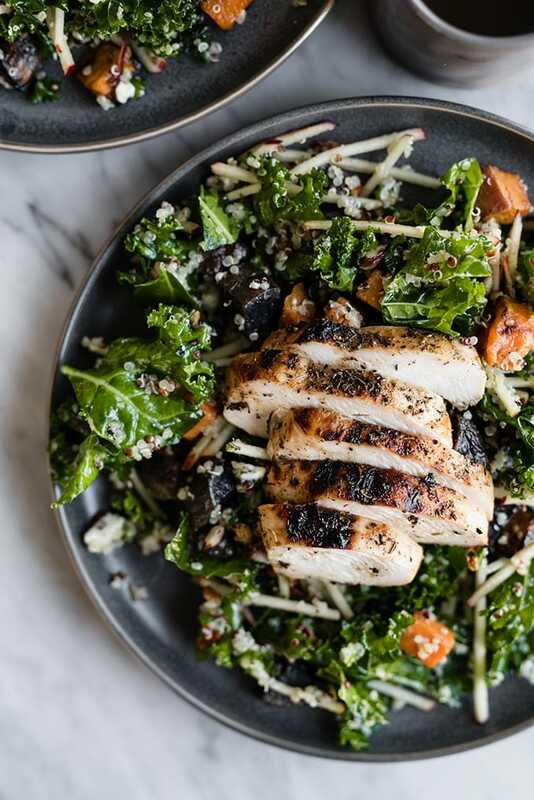 This kale chicken salad with maple cider vinaigrette is an easy, fast, and deeply nutritious weeknight gluten free dinner. 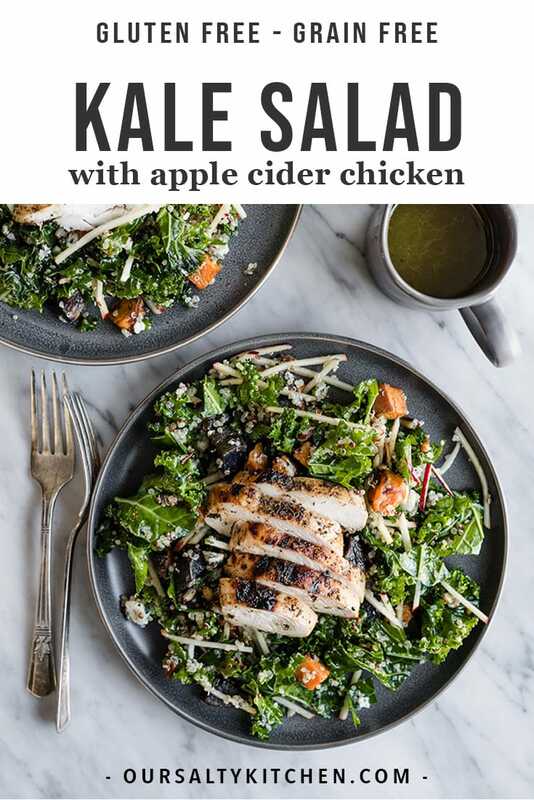 It's made with super crispy freshly picked apples, farm fresh kale, grilled apple cider chicken, and warm potatoes, then dressed with an addictive sweet and tart vinaigrette. 12 oz potatoes diced to 1"
See Notes for a link to my recipe for Apple Cider Brined Chicken. While the chicken is resting, prepare the salad base and maple vinaigrette. 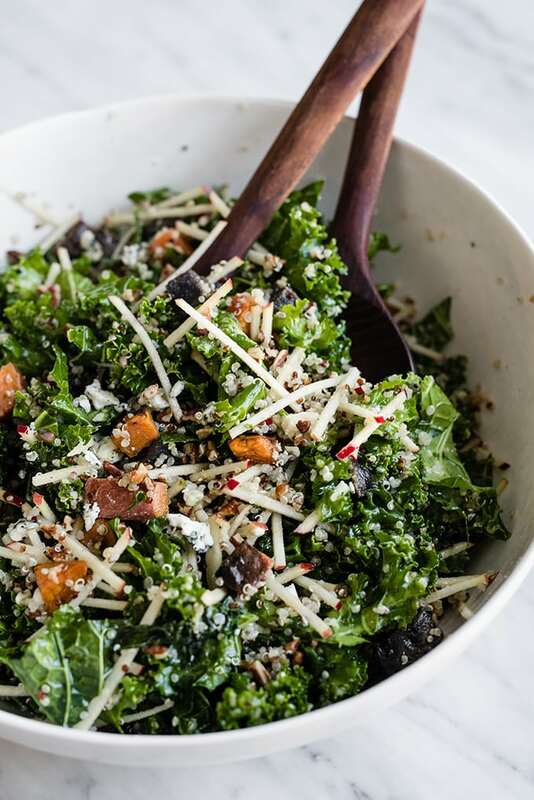 For the salad base, chop the kale and toss with the cooked quinoa. Julienne the apple, chop the pecans, and crumble the blue cheese, then addd to the kale-quinoa base along with the grilled potatoes. In a small lidded jar, combine the maple syrup, apple cider, apple cider vinegar, olive oil, salt and pepper. Shake vigorously to combine. Pour half the vinaigrette over the salad and toss to combine. 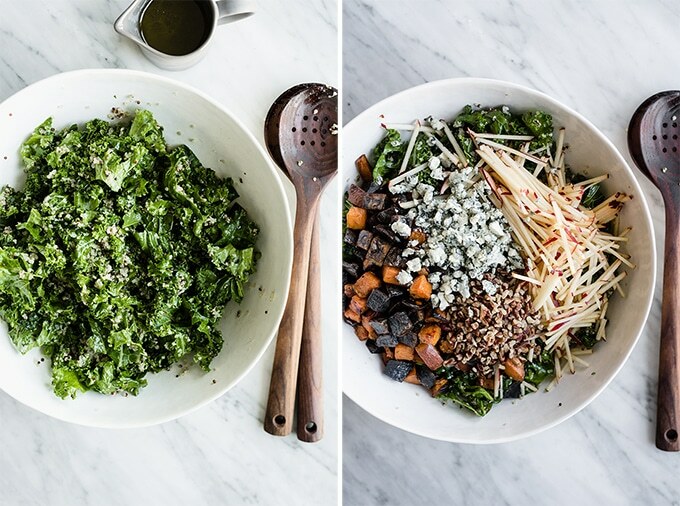 Dive the kale salad between four plates. Slice the chicken against the grain, and top each salad with 1/4 of the chicken breast. Dress with additional vinaigrette if desired. Serve immediately. 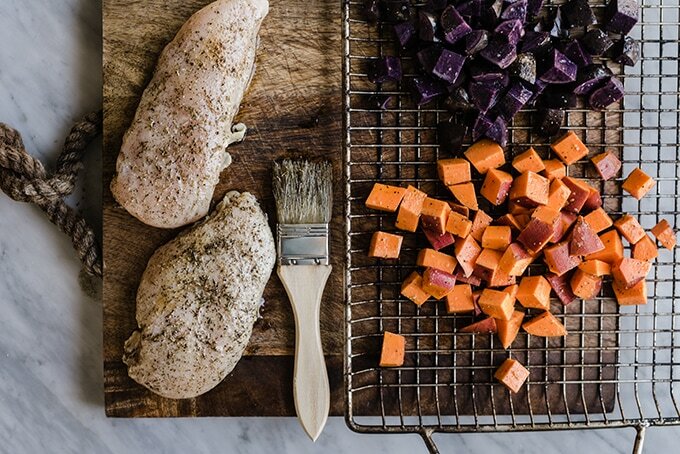 You'll want to start with this recipe for apple cider brined chicken. The marinade is easy and fast, and can be prepared the evening prior. Omit the cooked quinoa and blue cheese for a paleo version. Noted calories exclude the grilled chicken. 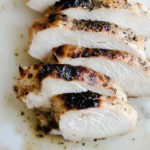 Calories for the grilled chicken are an additional 187 per serving. Disclaimer: This post contains affiliate links, which means we receive a small commission if you make a purchase using these links. Rest assured, we only endorse products we own and truly love! Love this post? Want more? Awesome. We're stoked to make it happen. Subscribe to receive new real food recipe posts (and more!) via email.